He had to cut the show short due to "heat poisoning"
The tumultuous times are continuing for Marilyn Manson, after the shock rocker collapsed onstage and cut his set short during a tour stop in Houston last night (August 19). As the Houston Press reports, Manson banned photographers prior to taking the stage, later telling the audience that he was suffering from "heat poisoning." Footage shows Manson collapsing onstage after performing a cover of Eurythmics' "Sweet Dreams (Are Made of This)." Starting his own set afterwards, Manson's tourmate Rob Zombie then told the crowd, "My dear friend Mr. Manson is feeling under the weather. He's probably on the bus feeling like crap." Manson took to Twitter early this morning to address the incident. "Thanks Houston for being understanding," he wrote. "I ended up in doctor's care, but I gave it my best and you guys were amazing." 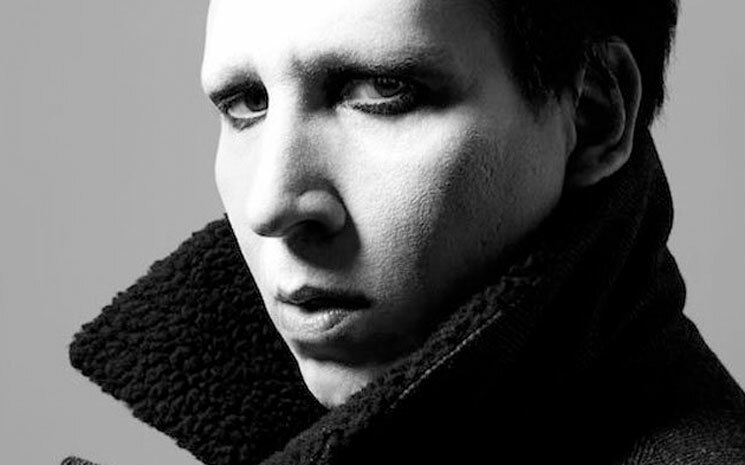 Late last month, Manson was forced to cancel a performance in Toronto, citing the flu. Thanks Houston for being understanding. I ended up in doctor's care, but I gave it my best and you guys were amazing.